One of my youth once pointed out to me that John 11:35 is the shortest verse in the Bible: “Jesus wept” (KJV). He thought he was getting out of a memorization exercise. It started a good discussion. Add the next few verses? John 11:45-53 frames the story amid Jesus’ rising conflict with leaders. Lazarus is the motive behind their plot to kill him. This is another typical monster passage with a lot to cover, and I may argue it is stopped too soon. 46-53 is an important part of the story. In the Gospel of John, the raising of Lazarus is the moment when the leaders decided that they needed to kill Jesus (it is better for one to die than the whole nation). This act made them realize just how dangerous Jesus is. probably not Mary Magdalene, or she would have been called by name. Chapters 11-12, Mary, sister of Martha. Also anointed Jesus’ feet with oil. In John, Mary’s anointing of Jesus’ feet comes in the next chapter, and it is tied directly to Judas’s betrayal. The anointing takes place immediately before Jesus enters Jerusalem. In Matthew, this scene takes place immediately before the Passover meal, and is only tacitly connected to Judas.. In Mark it takes place at Simon’s the leper’s house, and is the last thing before the Passover meal. v. 2 points ahead to 12:3. In John, this story is used to increase tension with Judas. In other Gospels, woman’s name is not mentioned. In Mark 14:3-9 an unnamed woman anoints Jesus’ head. it is connected to anointing of the dead. In Luke 7:36f, a nameless woman interrupts a meal with the Pharisees and does a similar act - anointing feet with oil and tears. It is shown connected to lack of hospitality of the Pharisees. Luke later names Mary and Martha, but there is no connection between this episode and them. 19:25, at the cross of Jesus stood Mary, wife of Clopas and Mary Magdalene. Chapter 20 Mary Magdalene finds Jesus’ tomb empty. Lazarus is ill “for the glory of God,” reminiscent of blind man last week. v. 8 instead of being “The Jews want to stone you.” It reads “The Jewish opposition wants to stone you.” Removes the conflict from generalized, and dangerous, “The Jews” to the reality of a select group that is in opposition to Jesus. Despite the fear of the disciples, Jesus moves toward the danger. He came from Bethany at Jordan to Bethany near Jerusalem, this is not a distant journey, less than 20 miles - one day’s journey. She believes Jesus could have healed Lazarus. Jesus is not a passive observer. Trials of life affect Jesus, even at his most powerful moment. Provides evidence that Jesus (and God) “suffering with” us. Jesus is “deeply disturbed.” The Greek suggests anger. What to make of anger? Was he angry at Mary and Martha for mourning? Was he angry at the crowds that wouldn’t leave him alone? Was he angry that his friend died? Perhaps just a normal part of grief process, that includes anger. “Deeply disturbed” connotes anger, not compassion. Jesus is described as “angry” at Mary and the Jews. The Jews say “Come and See”, which is the same invitation Jesus gave to his disciples. Jesus’ invitation to “Come and See” was an invitation to see new life, the light of the world, and the glory of God. “The Jews” invitation to “Come and See” was to witness death. They were presenting evidence of death and despair in the world. Perhaps Jesus’ anger is at the fact that death is the path to new life. The Jews interpretation of why Jesus is crying should not be accepted. “Throughout the Fourth Gospel, the response of the crowd, particularly when they are called ‘the Jews,’ is not to be trusted.” (O’Day, p. 691). V. 37 is not a statement of faith, but a statement of derision, much like the taunting to come on the Cross. He is “deeply disturbed” when he gets to the tomb - perhaps because they sealed it with stone, thinking that was the final resting place? When seen through the lens of anger, this conversation with Martha takes on a different tone. The community needs to be told what to do. Lazarus had to be unbound. People had to be there to finish the work Jesus had started. There is no rejoicing, simply belief or reports to the Pharisees. 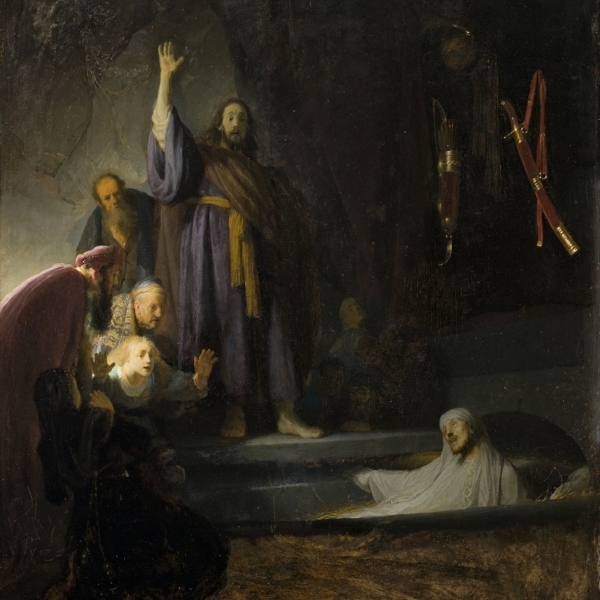 Lazarus is culmination of Jesus’ ministry. Everything builds to this moment. John 4:26: I who speak to you am he (the Messiah). John 11:25: I am the resurrection and the life. “Amid the symbols of death - intense grief, a skeptical and somewhat impatient audience, the odor of a decaying body, the tightly wrapped grave clothes - Jesus speaks and acts, and there is life” (Charles Cousar, Texts for Preaching, Year A, p. 226). “Jesus wept.” What does it mean to follow a messiah who wept? What does it mean to have a Savior who cries? A show comment from last time round the cycle: “I can never hear this account of Jesus' raising Lazarus without thinking of an impromptu Bible study I had with a bereaved mother in her hospital room. During my Clinical Pastoral Education unit (required for priests in training in the Episcopal Church), my assigned areas were the NICU (neo-natal ICU) and high risk pregnancy unit. I spent several days visiting and praying with this woman whose baby died in her arms just hours after being born. The last time I saw her, she asked, "Jesus brought Lazarus back from the dead. Why won't he do the same for my little girl? I'm pretty mad about that--am I going to hell? If I do, will I ever see my baby?" After I swallowed a river of tears and assured her that she was not hell-bound for being mad at God, I located the Bible in her room (thank you, Gideonites!) and started reading John 11. I even took time to explain about the Book of Signs and why Jesus raised Lazarus in the first place (can you say pedantic pastoral care?). When we got to the part where "Jesus wept", the woman stopped me. "Do you think Jesus is weeping for my baby?" "Yes, he's holding her now and weeping for her and for you." That seemed to be what she needed to hear. But it probably isn't what I'll preach about on Sunday. Or maybe I will preach about Jesus weeping, without using that story. Martha, Mary, and people all ask, “Couldn’t he have kept him from dying?” How often have we asked the same question? How often is bargaining a part of our grief? Can God prevent death? Can or Does God intervene to stop tragedy, or does he show up late and pick up the pieces? Raising of Lazarus is final act revealing that Jesus is life. It is done in full view of public, and reaction to his life-giving ministry is death. Death always follows life, but with Jesus, death is not the end of the story. Little rejoicing. Sometimes we are too shocked at something to react. In this story there are simply some who believe and follow, and some who report what happened to the Pharisees. Jesus’s life and ministry forces you into response. What are you inviting people to “Come and see.” Are you inviting people to come and see the new life, or to come and see death. Denial - Jesus waiting to leave. Acceptance - Some believe in Jesus, fulfillment of Jesus’ mission and self-revelation. From the valley of the shadow of death? From the drone of everyday-ness? From deep tragedy - cancer, divorce, loneliness, etc? It is easier to sin as a church, country or community - in other words we allows institutions to get away with things that we consider unacceptable for individuals to do. Waiting is isolating- v. 7 and 8 remind us of the corporate nature of waiting. What is the church waiting for? What does it mean to actively wait for God? Can we wait and remain faithful in the hope of something yet unrealized? Or do we give up and move on? Ezekiel 37:1-14 Can these bones live? Metaphorical Vision as described in v.11-14 depicting the resurrection of Israel, not proof of the bodily resurrection of Christians. Political resurrection/restoration also can only be restored through the power of God, but the people don’t realize this. “More than anything else human beings can hope for, Calvin claimed, the resurrection of the dead is so utterly dependent upon God that there can be no doubt that it lies outside of our powers. There are forms of immortality that one can recognize as intrinsic to existence in the normal course of things—the survival of one's heirs, influence, or reputation, for instance. For a body to be resuscitated long after it has begun to decompose, that is a miracle.” Kelton Cobb, Feasting on the Word: Preaching the Revised Common Lectionary - Feasting on the Word – Year A, Volume 2: Lent through Eastertide. Resurrection, in the view of early Christians (Irenaeus and Tertullian), required a body. However - the redemption of Israel will take place only through the power of God! Ezekiel is told to call upon the Spirit of God and give it life - when was the last time you called upon the Spirit of God? What is needed is not the latest technology or sermon series or program- what is needed is the word of God. The “dry bones” are listening, waiting & begging for someone to bring the Word. When was the last time you called upon the Spirit of God to fill your congregation? I always think the Spirit is already present, but perhaps it is a both-and. Perhaps calling upon the Spirit/invoking the spirit not only summons the breath of God, but makes us aware of its presence. Who in your congregation is in need of renewal and resurrection? What groups or communities are in need of renewal and resurrection? What word of God are they waiting for?